Attending Studio Lottery is required for all traditional curriculum students taking Segment II Studios (C1 and C2) or CD105 workshops, and all new curriculum students taking Arch 3 or Arch 4, or their DME2100 workshop. If you have extenuating circumstances that prevent you from attending, please contact Director Kerri Frick (Kerri.Frick@the-bac.edu) regarding traditional curriculum studios, and Director Kyle Sturgeon (Kyle.Sturgeon@the-bac.edu) regarding new curriculum studios. • IA, LA, and BDS students do not participate unless directed by the Dean of your program. • Architecture students taking Foundation Studios, Arch 1, Arch 2, or Adv. Interdisciplinary Studio do not participate. • At this time, traditional curriculum students are not eligible for new curriculum studios. • Completed forms must be returned to Kerri Frick or Kyle Sturgeon by 7:30pm on lottery night. • Lottery results will be available by noon via the Student Development Blog the following day! Instructors briefly present their studios and workshops. Students then meet with instructors to determine what their top five choices are. 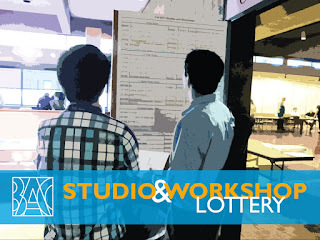 Students complete forms and hand them directly to Studio Lottery administrators. The registrar will automatically register students for the assigned studio/workshops. Students should not try to drop the course and add another; they will be prevented from adding/changing studios. Students must contact Kerri Frick (traditional curriculum) or Kyle Sturgeon (new curriculum) via e-mail to discuss or resolve any problems presented by the lottery results. Lottery is based on seniority. If a student has completed (3) Core Studios, then the student will likely get his/her first or second choice. If a student is taking their first C studio, then the student is not likely to get his/her first or second choice. New curriculum students take Arch 1-4 then Advanced Interdisciplinary in sequence, but often have options for their instructor. These studio are composed by Kyle Sturgeon with high consideration for your preference – often leading to ‘hybrid’ studios with both M.Arch and B.Arch students. After seniority, reasons written why a student wants to study with a particular instructor are meaningful – please include relevant information to this regard on your selection sheet. Make certain to say so on the lottery preference form. If a student wishes to study with a friend, this should also be included on your selection form. Traditional Curriculum Students: How to choose a Core studio (C1 or C2) or a Workshop?